How do you discover new movies to watch? For me, it is mostly friends recommendations. Or the decision is based on news and advertisements. Other than that there is no real way to know which movie to watch next? Is it? A decision to watch movie shouldn’t be a painful experience. Many times it happens that we browse Netflix queue for hours but can not decide on a movie. By the time we pick a movie, the interest is gone. Are you tired of searching for a new movie to watch, let your friends help you? If you are in the same boat, then you will be happy to know that there is new service in town – Movienr. With Movienr, you can discover new movies, get personalized recommendations based on movies you have watched and engage with other movie addicts. How Movienr can help you discover new movies? Just select the genre you are interested into and Movienr shows you movies only in that genre. You can further drill down to specific countries or year range etc. 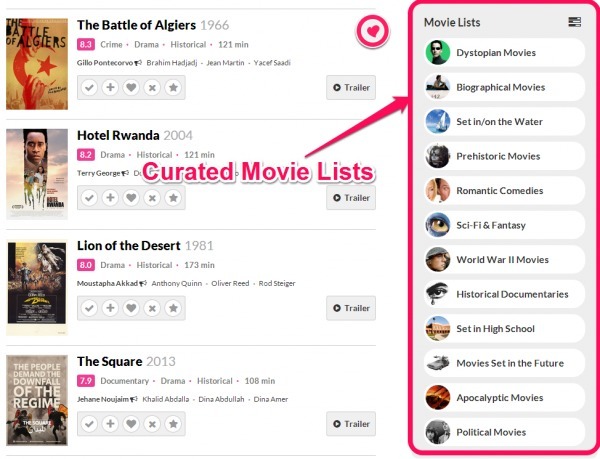 Movienr came up with a new way to filter movies – based on Theme, Place, Period or Origin. There is also a section for New Movies. It doesn’t get any better when you can discover movies like – “Set in/on the water”, “Prehistoric Movies”, “Romantic Comedies”, “Set in High School” and “Political Movies” etc. Just browse any list and watch movies based on the recommendation. 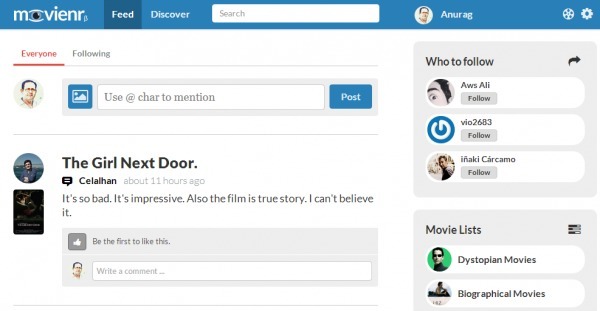 In the era of Social networking, how can movie recommendation be without social twist. Go to the feed section and check out what movie addicts are watching and recommending. All listings have trailers right next to them, so don’t believe the ratings, watch the trailer and decide. More movies you rate, the better the recommendations get. 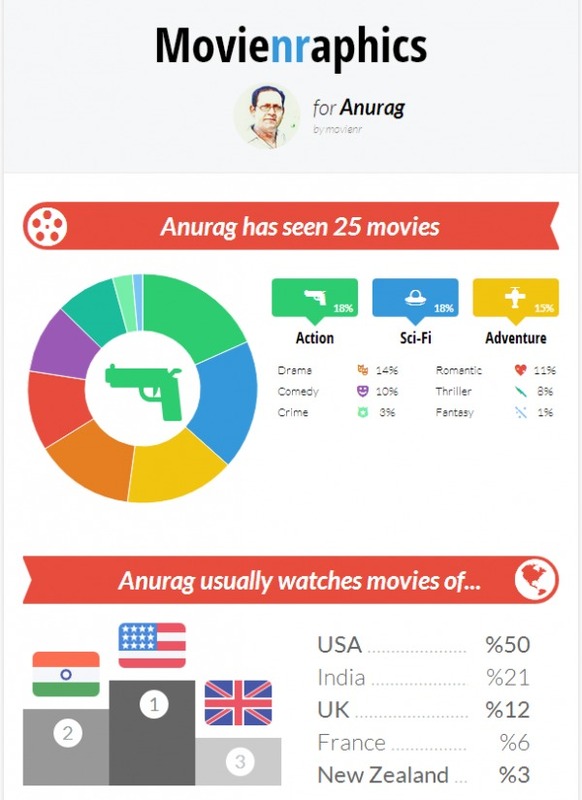 Movienr also creates an infographics called “movienraphics” based on your ratings automatically. With this infographics you can quickly see which kind of movies you like the most. It is an interesting way of showing your movie interests nonetheless. Since the service is still in beta, there might be some issues once in a while. But in my test, it worked smoothly. I would love to bring in my Netflix and Flixster ratings so that I don’t have to rate movies again in movienr. If I like something I want to watch, there should be a link to either Netflix, Hulu etc. It would be a value addition to the service if I can also buy tickets directly if the movie is in any nearby theater. Movienr is a great service and I am sure people who struggle to discover new movies to watch will love it. Check it out and let me know in comments what you like and don’t like about it. Awesome, thanks for the visit. Let me know when you have something to share further with our audience. They would love to know.